Rollbacks on Obama-era environmental Protections: A sweeping new Executive Order passed on Tuesday March 28 includes rollbacks on emissions rules for power plants, limits on methane leaks, a moratorium on federal coal leasing, and the use of the social cost of carbon to guide government actions. EPA Budget Cuts: The Hill reports that the new administration seeks to cut the Environmental Protection Agency budget by up to 31%. Undoing the Clean Water Rule: On February 28, President Trump signed an Executive Order instructing the EPA to reconsider the Clean Water Rule. The Clean Water Rule, currently blocked by an appeals court, protects smaller creeks and wetlands under the Clean Water Act of 1972. Here’s more on the Clean Water Rule EO from The Hill. Rollbacks on Bans of Known Neurotoxins: National Public Radio reported that the new administration decided not to ban the pesticide chlorpyrifos (see here for coverage by NYTimes), despite EPA’s own documentation of significant risks. The Pesticide Action Network reports that chlorpyrifos is moderately persistent in soil and can take weeks to years to break down. The insecticide can also reach rivers, lakes and streams, where it concentrates in the fatty tissue of fish. According to the National Water Quality Assessment Program, chlorpyrifos contaminated surface water in urban and agricultural streams at levels potentially harmful to aquatic life. 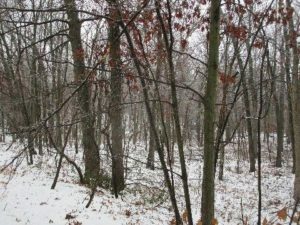 Starting from a belief that enduring environmental values will help us withstand current shifts in political winds, the LRWP is initiating a series of short blog posts to reflect on the normative standards that structured the last several decades of environmental politics in New Jersey. Throughout this series we will draw attention to those actions that relate most directly to improving the the health of our Lower Raritan Watershed. We will also highlight other successful regional approaches that we can learn from to benefit our Lower Raritan River and local streams. Topics will include state-based policy making as well as alternative approaches including court actions, collaborative politics, and “private” pathways e.g. land trusts, consumer purchasing power and business actions to achieve sustainability. We also expect to explore mitigation banking, and proposals for stormwater utilities. In short, we want to identify a compendium of actions that might be brought to bear to further protect, enhance and restore our central New Jersey environmental landscape. Institutionalization of all the above on-going project and program efforts at NJDEP speaks to a on-going commitment to environmental priorities for New Jersey’s future. As environmental non-profits and concerned citizens we must regularly articulate our expectations associated with these priorities and hold NJDEP accountable for meeting our expectations. The LRWP employs civic science to better understand the health of our watershed. Our volunteers engage in activities like water quality monitoring, soil sampling, pollinator counts and mapping of invasive and threatened/endangered species. The data our volunteers generate is a key input to our analyses and restoration prioritization. While the LRWP’s mission centers on protecting, preserving and restoring habitat and biodiversity within our Lower Raritan Watershed, our civic science approach to data gathering speaks to another core purpose: by training community volunteers to monitor and report on the health of the environment we work to ensure that science, community engagement and environmental stewardship become a permanent part of the culture and identity of the Lower Raritan Watershed. The crowd, using mobile tech, and the cloud contribute to science that saves lives. In this episode, you’ll hear stories of everyday people contributing data used for emergency management, researching Alzheimers, mapping oils spills, and more. Citizen scientists track air pollution in Wyoming, test for lead in Philadelphia’s drinking water, fish for data in coldwater trout streams and report environmental crimes in China, using the “Black & Smelly Rivers” app. Hear all these stories and more in Episode 2. Real-time data helps track environmental triggers for asthma sufferers and citizens confront air pollution and rising asthma rates by collecting real time data. In this episode, explore how maps and apps can combat globalized disease from asthma to Zika. This episode explores a Year in the Life of Citizen Science. Counting birds with an app, surfers collecting ocean data while they ride the waves, volunteers surveying horseshoe crabs on the Delaware Bay, and butterflies wintering over in California. 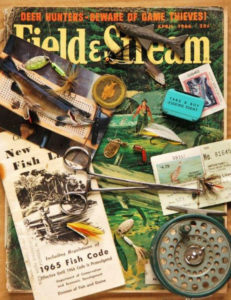 Field and Stream dreams come true on the South Branch of the Raritan. Opening day of the NJ trout season stirs memories as strong as a lifetime of Christmas morning and birthday surprises. 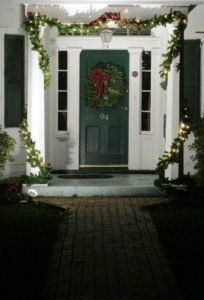 Right along with the anticipation of presents on Christmas morning, April and the opening day of fishing season both involved a dedicated countdown. For a month, each passing day was marked with a big X on the complimentary Esso service station calendar. 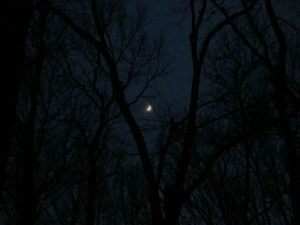 It was understood, there would be no sleep on the eve of this once a year event. Times have changed but tradition still lingers as many NJ anglers prepare for the opening of trout season in early April. One of the best places to live out a fishing fantasy is in Branchburg. As the name implies the township is bound for the most part by the North and South branches of the Raritan River, both heavily stocked with trout by the NJ Division of Fish and Wildlife. Of course trout are not the only game in town. As the river flows from the mountains to the sea, fish can swim upstream as well as down. What that means is tiger muskies and hybrid bass can find their way downstream from Spruce Run as well as stripped bass, hickory and American shad can migrate upstream from the Atlantic Ocean. The state had been using an underwater camera to monitor quantity and species of fish in the area around the confluence of the Raritan and Millstone rivers, species you wouldn’t believe were observed. It was reported in a news article several years ago that trophy brown trout, walleyes, muskies, stripped bass, shad and several forage species were recorded. The beauty of fishing a river is you never know what you might catch. While trout get the most press, the lower river is primarily a seasonal trout fishery with most angler activity occurring around opening day and subsequent stockings. It is considered to be ‘put and take’ fishing. There are holdover trout but you have to search for them. It is reported trout will travel distances to find suitable habitat with the water temperature being a prime factor. Each species has a preference for a specific temperature range so be sure to carry a thermometer if you want to become serious about your fishing. The South Branch is also chock full of smallmouth bass which are a year around fish. Fish in the twenty-two inch range have been reported. Smallmouths in the twelve to fifteen inch range have a tendency to tailwalk on the surface of the water while their big brothers often stay deep and pull hard. My favorite lure for these ‘bronzebacks’ is a Panther Martin spinner with a small curly tailed grub on an ultralight fishing rod. Always have a hemostat or thumb forceps handy to remove the hook from any fish you wish to release. Fishing methods and equipment span the spectrum of human imagination and most are effective on any given day. Expensive Orvis fly rods to lawn chairs and igloo coolers, garden worms to woolly buggers to Mepps spinners all take their share of fish. Fishing allows for as much science, superstition or tradition you might want to use in your piscatorial pursuits. There are even solunar tables which scientifically predict the best days to fish, however, everyone knows the best day to fish is whenever you get the chance. So if your bumper sticker proclaims, “the worst day of fishing is better than the best day at work”, you already have your gear in ship shape condition and have started your countdown to the April 8th NJ trout season opener for 2017. Article and photos by Francisco Gomez, Founder and Director of Raíces Cultural Center, a non-profit organization dedicated to preserving cultural roots through the arts, history and ecology. 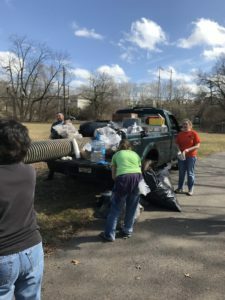 With many thanks to Francisco and the Raíces Cultural Center for joining us for our February 25 clean-up of the Raritan River floodplain in Piscataway. We headed out for Johnson Park last Saturday for a river clean-up of the Raritan. There were about a dozen people gathered as we were given our trash bags and long reach garbage grabbers to tackle the debris. I often take my daily walks along the river, especially during the Spring and Summer. There’s always been something special about the water, as polluted as it is, wildlife and the people that are out doing what I do to get my daily dose of Nature. Having walked the river ever since I was a kid, and let me say many moons have passed since then; I have witnessed the gradual environmental destruction of this once great water way. As a child growing up in Perth Amboy, I would hangout on Mechanic St. with my friends. We would walk to the waterfront and dive off of a dock at the end of Buckingham Ave., adjacent to the Chevron Oil Refinery. At the end of the dock there was moored an old World War 2 mine sweeper that we would explore when we weren’t swimming in the entrance to the Arthur Kill and across the Raritan Bay to Staten Island. That was the early 1960’s and the water was still good enough to swim. At some point in 1961 we noticed oil spots on our skin when we came out of the water, and we reeked of petroleum. Needless to say, we stopped swimming in the bay and that wonderful part of our childhood came to an unwanted end. It would be many years later, when I became involved in the environmental movement, that I fully understood the negative impact of what corporate greed and indifference to Mother Nature had done and is still doing. As our crew scoped out the coast line for garbage, a sudden sadness and anger overwhelmed me at the same time. It brought to mind a commercial clip made back in the early 1970’s of a First Nation’s man who rows down a river in a canoe, and as he gets into the greater water way he begins to see the incredible amount of garbage thrown into the river by humans. He also sees all the petrochemical companies spewing toxic waste from their chimney stacks and the pipelines from their factories that drain into the bay. When he gets out of his canoe by a highway, one of the cars passing by tosses a bag of fast food that lands at his feet. As he turns towards the camera you see a tear roll down his cheek. The actor’s name is Iron Eyes Cody, but what he was seeing was no act! As we continued our sweep of the coastline I understood fully what our disregard and disrespect for Nature has produced. Just attempting to clean-up the vast amount of debris in one minuscule patch of river line was daunting and seemed totally futile; I believe this is what made me so angry. I know that I’m not without blame, for I have also contributed to this catastrophe in one way or another, directly or through the forced machinations of the corporate Matrix. Enter the Lower Raritan Watershed Partnership. This is the organization who coordinated the river clean-up and does the remarkable work of attempting to protect the Raritan River. These guys do everything from stewardship, civic science and environmental monitoring, habitat and ecological health, Eco-art and, of course, lots of clean-ups. Two hours later we had collected a number of bags filled with trash, a bicycle, one or two huge plastic tubes and a very heavy corroded metal lid. The truth is we barely made a dent in our clean-up. Volunteering to be part of these clean-ups can be quite disheartening and almost pointless because of the amount of new trash that is dispensed onto the landscape and into the river each day. However, one should not be deterred from joining in to do this most important work. There is some recompense in watching a jogger or cyclist pass by, smile and thank us for collecting what seems to be a very small amount of garbage. There is satisfaction in cleaning up other people’s carbon footprints, even if you may not believe so. 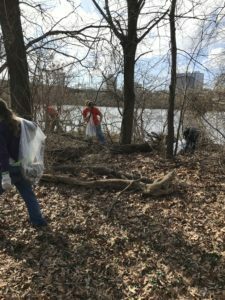 So if you’re so inclined and want to do your part to make the environment a little more ecologically balanced, then come out on one of the workdays and get a little dirty so we can make the Raritan River a little cleaner again – you won’t regret it! 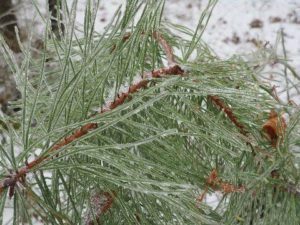 Ice builds up on the needles of a pitch pine, Pinus rigida, the common tree of the New Jersey Pine Barrens. Here, in the Jamesburg Park Conservation Area in the Pine Barrens around Helmetta. 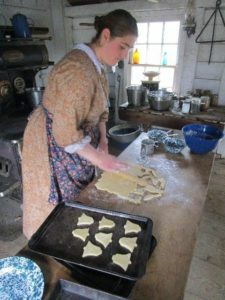 Christmastime at historic Longstreet Farm, the Monmouth County Park System’s living history farm, replicating the late 1800s in Holmdel. Here, baking cookies the old-fashioned way. 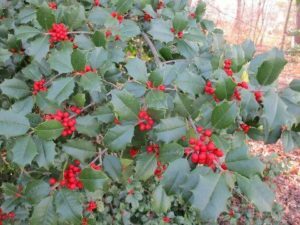 Holly in my neigbhorhood in Monroe, Middlesex County. Joe Sapia, 60-years-old, grew up and lives in the Pine Barrens around Helmetta, where his family has resided for more than 100 years. He can be reached at Snufftin@aol.com or at P.O. Box 275, Helmetta, 08828.